Today, let’s talk about speech structure. WHY IS USING A SPEECH STRUCTURE SO IMPORTANT? Obviously, it’s important to organise your content – for audience comprehension as well as ease of delivery! If you have a quick and easy speech structure at your disposal, then that also means you will be able to prepare yourself very quickly. It almost makes me want to cry when I speak to clients and they tell me they have loads of speaking opportunities at their disposal but turn them down either because they’re afraid or nervous, or because they think it’ll take too long to put the presentation together, and they’re too busy to make it happen. 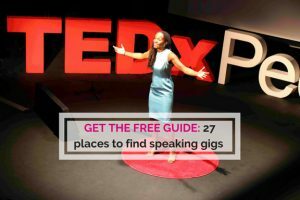 There are so many people out there who want to get on stages and speak. So if you’re in the fortunate position of having gigs at your fingertips then let’s not waste them! What I want to do today is give you a very quick and easy speech structure. You can use it when you’re giving a 5 or 7-minute talk or even when it’s a much longer presentation. This structure will still work. The very first thing you want to do is to grab your audience’s attention. There are so many ways you can do this, for example, you can say something surprising or tell them a story. Say who you are and what qualifies you to be there! 3 – Tell the audience what’s coming when public speaking. Tell the audience what’s coming so that they’re not sitting there wondering whether they might be in the wrong room! Give them a flavour of what’s ahead and what the benefits are of listening. You can also share that you understand their problem or situation. At this point, you share your content in three points. Three is a nice easy number for human beings to grasp. I don’t know why three is so magical but it tends to be. Two often feels like not enough, four seems like too many, so three is just right. If you have lots of content or a longer speech duration, you can break each of your main points down into 3 sub-points. During your wrap-up you summarise your key points and ask the audience for their takeaways. This helps cement their learning, and is useful for you as the speaker to learn what landed and what didn’t. During the wrap-up it’s also appropriate to hold your Q&A session. Finally, provide the audience with a call to action. What are they supposed to go out and do after they’ve heard you speak? What should they do with your message? So, now you have a really quick and easy speech framework that both professional speakers and people who just started speaking can use. There are other frameworks besides this one and of course, you could take time to make a short pitch if you’re there to promote a business. And including stories in your 3 main points and possibly during your intro and ending is really important if you’d like to hook your audience and keep their attention. But if you’re reluctant to speak because you think it’s going to take too much work to organise your thoughts, then hey just keep this little framework in your back pocket! You can even use it if you’re asked to speak on the fly and are given a very short amount of time to put something together. This is a tried and tested formula that works. So no more turning down speaking opportunities, OK?! Go out, shine and let the world know you’re here. 3 – Enrol in the course — 6 Week Speaking Success. This is all about giving you the skills to be comfortable and confident on stage. Learn to engage, inspire, add value and be yourself. Other modules include how to be better at speaking off the cuff and how to have more gravitas and presence as a speaker. It’s an online course you can work through at your own pace. Although there are more than 6 hours of content you can pick and choose – you don’t have to work through it in order. Start with the areas you need most help with and build in the rest later. 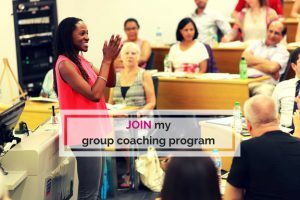 4 – Join my group coaching program – Get Clients with Speaking in 60 Days. 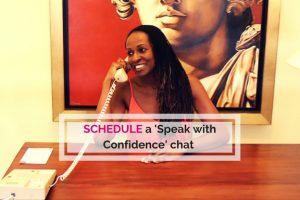 5 – Find out about my VIP Days and private coaching.